After giving a talk and two workshops to the Year 10 students at Oundle School, I came back to London and headed to Shoreditch. A team from the Museum of London has found the remains of The Theatre, the playhouse built by James Burbage, and dismantled by his actor-son Richard, Will Shakespeare & their Company, one night in 1599. The materials were used to build the Globe playhouse across the river. The Tower Theatre Company have begun a fund-raising project to build a new theatre around the site, and protect the remains. They asked me to come and speak a sonnet there yesterday. I performed Sonnet 116 in OP on the Groundlings Gravel – one of very few actors to have spoken Shakespeare – and the first time that accent has been heard there – in 400 years. A breathtaking moment. I’m a very lucky fellow. Please head to the The Theatre’s website, and support the project. Toast nominated for PlayShakespeare.com’s Falstaff Awards! Posted on May 8, 2010 in: Shakespeare on Toast|Comments Off on Toast nominated for PlayShakespeare.com’s Falstaff Awards! The kind folks over at www.playshakespeare.com (who’re also responsible for the Shakespeare iPhone App) have had their annual Falstaff Awards, and Shakespeare on Toast was nominated for their Best Book or Publication category. Up against some steely competition, including Andrew Gurr’s Shakespeare’s Opposites and AD Cousins’ The Shakespeare Encyclopedia, I’m touched and honoured Toast was up for consideration. British Psychological Society, Stamford Shakespeare Society, & Rebel Shakespeare Company! Posted on April 21, 2010 in: Speaking Dates, Shakespeare on Toast|Comments Off on British Psychological Society, Stamford Shakespeare Society, & Rebel Shakespeare Company! Apologies for the lateness in this post, but last week was somewhat frenetic. Following on from the great gig at Peter Parker’s Rock’n’Roll Club last Monday, I had been kindly invited to give the after-dinner speech at the British Psychological Society’s 2010 Conference in the ever-beautiful Stratford-upon-Avon. A terrific evening, with much fascinating post-dinner in-depth analysis of Life, the Universe and Everything Shakespeare with some of the delegates. Then on Friday I whisked myself over to Tolethorpe Hall – a beautiful manor near Stamford, with a wonderful open-air theatre where the Stamford Shakespeare Society perform, to speak at the Cambridge Welland Valley branch of the English Speaking Union for their annual Shakespeare Literary Lunch! Last, but by no means least, a wonderful day in London’s Regent’s Park yesterday, running a workshop on Acting Shakespeare for a terrific bunch of young American actors, all members of the Rebel Shakespeare Company, from Salem, MA. Up a considerable 3,345% (! 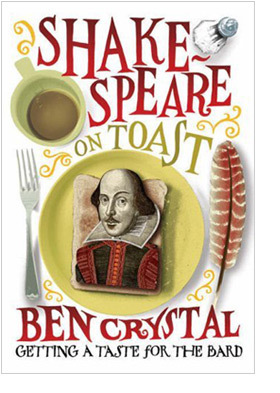 ), Shakespeare on Toast is no.5 today in The Book Depository‘s Fast Mover’s list.. This is a fascinating read – Shakespeare toasted lightly and buttered, slice by slice, by an author/actor whose passion for the subject shines through. Amazon.co.uk — Out of Stock! Posted on December 8, 2008 in: Shakespeare on Toast, General Shakespeare|Comments Off on Amazon.co.uk — Out of Stock! Amazon has been out of stock of Toast for a little while now – I’m assured it’ll be be back in stock in the next couple of days, but in the mean time I’d recommend The Book Depository, one of my favourite online book stores. A fantastic workshop this morning at the Royal National Theatre, as part of the William Poel verse-speaking festival. Cicely Berry, the grand-dam of voice and Shakespeare gave the workshop after mine – I intended to stay for 5 minutes, and was there until the end. Great to watch a master at work. Now off to Hay-on-Wye, for the literary festival’s Winter Weekend. I’ll be reading for Libby Purves tomorrow morning, then giving a talk on Toast tomorrow afternoon, at 2.30pm.